Other than Tesla’s Supercharger network and VW’s Electrify America, we spend most of our time talking about EV infrastructure in Europe. There always seem to be more developments across the Atlantic, but we are proud to report on some American infrastructure being built, even if it only encompasses a small chunk of the US. 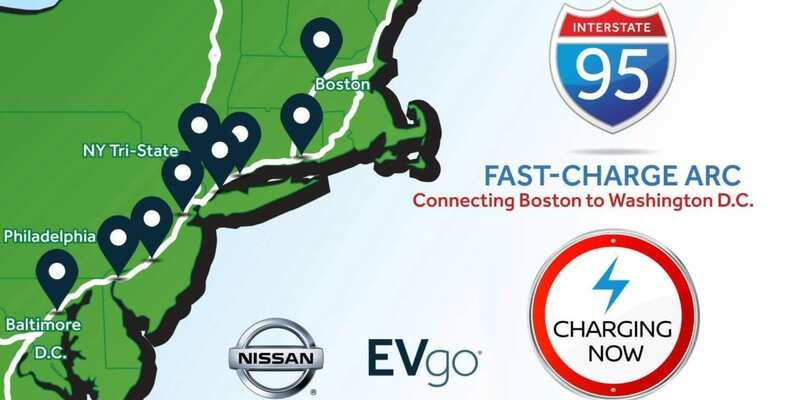 Recently, the partnership between Nissan and EVgo announced a section of I-95 between Washington D.C. and Boston that has had a string of charging stations installed. To be more specific, within the 500-mile stretch of road are 9 EVgo DC Fast Charging stations equipped with 52 fast chargers in total. They are equipped with both CHAdeMO and Combined Charging System (CCS) charging outlets to give the most accessibility to electric vehicles on the road. Unfortunately the power output for the time being is only 50kW, but each charger has been pre-wired to to be upgraded to 150kW fast-charging when EVgo deems it fit. While it may be only a small portion of the country being serviced with this expansion. The Northeast corridor of the United States is one of the most populated areas in the country. This expansion will reach the largest amount of people just by the sheer population density in the area. Other than California and the West Coast, it is also probably the area in the US that is quickest to adopt electric cars. For those curious at the pricing of EVgo, feel free to check out their charging plans page for your appropriate state to see what the cost would be to charge at one of these stations. Luckily for those with a Nissan LEAF, they will have free charging for two years for this route and many others from EVgo due to the partnership between the two companies. Session times are 30 minutes for DC charging and 60 minutes for Level 2 charging, completely free. Should you go over your session time, you will be assessed additional fees at a rate of $0.10 per minute for DC charging and $1.00 per hour for Level 2 charging. So in the grand scheme of things, it might seem like just another small part of the US received more EV chargers. But it is another small indication of the shift towards electric cars being the norm. What do you guys think? What’s the next route that is desperate need of more chargers? Let us know down in the comments below.